On Wednesday, though on empty stomachs we waited eagerly for the speaker to arrive. It was none other than Ankush Grover, the beloved CR of our senior batch.The ambience immediately changed on Ankush's arrival. His big smile made the environment more comfortable. He persistently stressed upon improving the culture at SOM. SOM students need to be more engaged and outgoing rather than being diffident. "Criticize or get criticized", were his exact words. Ankush shared his thoughts on the future path for the junior batch. He spoke on the importance on summer internship and the need to show professionalism and to put the best efforts for the long term benefits of both the intern and SOM. 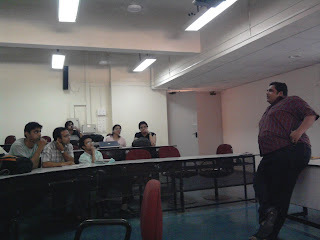 He emphasized on improving the networking skills and not forming closed friends groups. He also wanted networking lunch between the students and the delegates in the future continuums. Positively, in the current operations continuum we are having a networking lunch. Apart from the serious part which actually consumed only a few minutes of the 25 minute session, Ankush shared his lighter experiences. One of the incidents was particularly funny when Ankush was on two of the articles on the notice board. One read 'Ankush Grover has been nominated to the hostel council" and the other read " ". 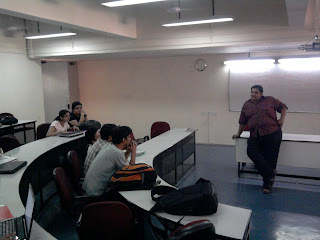 Parasuram then persuaded the junior batch to ask Ankush the right questions ('non-academic ones'). In his best efforts of persuasion Parasuram himself put-forth the questions. Ankush then told us about the best dating places near IIT Bombay ('NITIE-Goregaon road') and eateries to the joy of the batch. Not able to land a date? Would like to top your dating game? 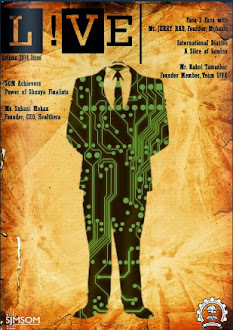 We present you with the solution to enhance your personal skills and tips to "What to do right". Make sure you follow them and leave the bar with a date tonight.